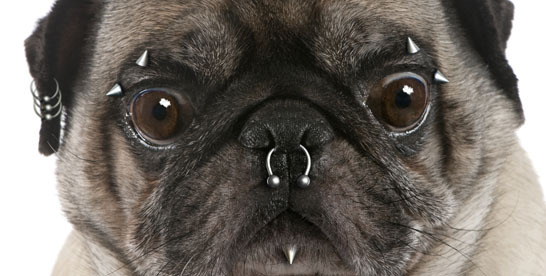 A law about to be passed in New York, S.6769, will make it illegal for pet owners to inflict tattoos or piercings on their pets except for medical purposes or when a tattoo is used strictly for identification purposes. Violations would carry fines of up to one year in jail and a $1,000 fine. “I believe that if given the choice, animals would decline to having themselves undergo a painful procedure of being either tattooed or pierced,” said New York State Senator Mark Grisanti, a Republican who is supporting the measure introduced by Democratic Assemblywoman Linda Rosentha in 2011. Ya think? The fact that a law would even be necessary to articulate that tattooing or piercing a pet for the owner’s amusement is horribly wrong and obvious cruelty foretells the approaching apocalypse. That such a law would take three years to pass also tells us something bad about, oh, New York, politics, partisan warfare, human intelligence…just about everything. The problem, was brought to public attention by the prosecution of this idiot.